Few college students wanting to major in an engineering discipline who begin in precalculus actually complete an undergraduate engineering degree program. One reason for this is students struggle through calculus I and II, known barrier courses for engineering majors. This research utilizes frameworks of future time perspective (FTP) and self-regulated learning (SRL) to explore one successful student’s experience as he struggled through his mathematics courses, but was able to overcome those struggles and graduate with an engineering degree. A case study was constructed around this student, using quantitative data from his mathematics and engineering courses, as well as qualitative data in the form of an open-ended survey and interviews. A mathematics instructor, who modeled self-regulation strategies as he served as the student’s mentor, was key to his success in passing the required courses in the calculus sequence. A model of interactions between FTP and SRL was developed based on an existing model and insights from this case study. By understanding the experience of one of the few successful students, educators are better equipped to assist other students and increase the number of students persisting in engineering, which will help address the global need for more engineers. Van Dyken, J. & Benson, L. (2019). Precalculus as a death sentence for engineering majors: A case study of how one student survived. 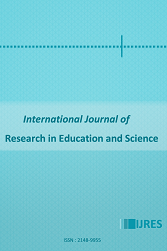 International Journal of Research in Education and Science (IJRES), 5(1), 355-373. ISNAD Van Dyken, Jennifer , Benson, Lisa . "Precalculus as a Death Sentence for Engineering Majors: A Case Study of How One Student Survived". International Journal of Research in Education and Science 5 / 1 (January 2019): 355-373.